Cooking fish can be tricky, but these two recipes for salmon will yield a perfect dish pretty much every single time. Be sure to select the freshest filet possible. I prefer wild caught over farm raised, but it tends to have a firmer texture and more flavor than farm raised. Either way, it should not smelly “fishy” and if it does, it’s been sitting too long to enjoy. Once you have your big beautiful filet home and in your kitchen, give it a good rinse in cold water and gently pat dry with a paper towel. If you feel any bones in the filet while rinsing, go ahead and pull them out carefully and discard. Now, all you have to decide is which way you want to cook it: in the oven or on the grill? Bake uncovered 8-10 minutes; test to make sure it’s cooked through (no translucence) but not overcooked. 15 minutes should be the max. Remove from oven and let rest for a hot minute while you are plating the rest of your meal. Enjoy! Remove from grill and let rest for a hot minute while you are plating the rest of your meal. Enjoy! saute garlic in sesame oil for about a minute, then add in soy sauce and sesame seeds. 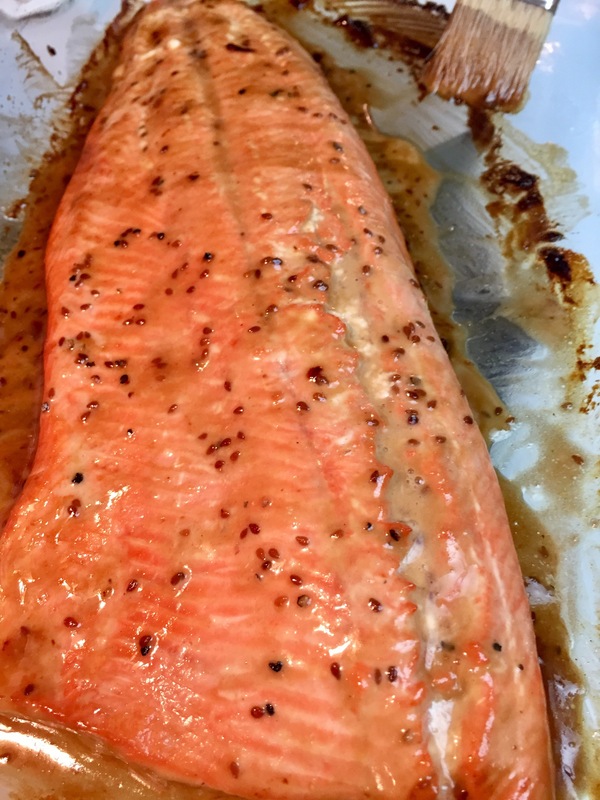 Remove from heat, let cool, then pour over salmon to marinate.